Set on a ridge in the Ozark Mountains of NW AR, we offer 91 sites with beautiful views and gorgeous sunsets. Ride the trolley to downtown Eureka Springs only minutes away, enjoy our pool or use our pavilions with large BBQ's. I came to the campground for a month and ended up staying 5! Beautiful park and management is great! Quiet and peaceful! Park Location was great and close to town. Cons: RV spaces were so close we couldn’t put our awnings out. WiFi was so bad we couldn’t get connected until 10:30pm-8am. Our site was also right next to road so we got lots of traffic noise. The roads in/out of this area are curvy, steep and narrow and took almost 2 hours longer than expected to get to hot springs. We didn’t use facilities so I can’t rate that. Pros: park is pretty, clean and easy to get to directionally. We enjoyed our visit to Eureka Springs and would like to come back. The park is only 1 mile to the Passion of Christ museum and play. This was a surprise to us and we had fun checking that out and finding the Jesus statue. People were friendly and welcoming. This place is great! I swear, the CLEANEST bathrooms / showers of any campground we've stayed at! New owners are clearly pouring a ton of work and effort into what was already a nice campground. Great pool, beautiful sunset views, trolley stop right on the property the only thing that keeps me from giving a 5-star 'overall' rating is the lack of a fenced-in area as a dog park in one of the grassy areas. If we didn't have dogs with us, hands-down, a 5-star rating! This was by far one of the nicest RV parks that we have stayed in since we bought our travel trailer (2 years). The folks at the park were friendly and the sites and grounds were beautifully maintained. Very easy to find and was close to town (Eureka Springs), but far enough away that it was very quiet. Can't wait to go back for a longer stay. 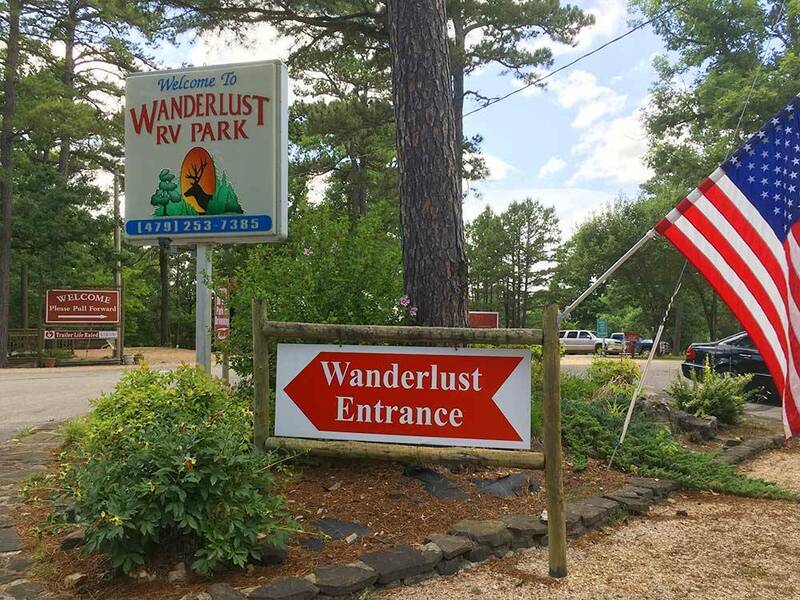 Pros: very friendly and helpful staff, convenient to attractions in Eureka Springs, trolley stop at campground for transportation to town and back, very reasonable rates. Cons: Many of the sites are small (including ours), very close together, and not level. We were in the front section near the road which, of course, had some road noise, the back section probably does not. Another reviewer said to request a specific site which I think is a good idea, but our confirmation email stated very clearly they do not guarantee specific sites. This was our first stay at Wunderlust. The was staff very helpful, friendly and made our stay the best vacation we have had in a long time. I would highly recommend them. Came in after hours, map and directions to our camp site was waiting at the office. This was our first trip here, map gave us easy directions to our camp site. When I made my reservation I requested shade, close to the front and by bath house. To my surprise, I got all three of my requests, first camp that has ever accommodated my requests. . People checking me in were knowledgeable about the area and friendly. Bath house very clean, pool and grounds very clean. Spent our afternoons being lazy in the pool meeting people from around the country staying there also. The camp site were a little close together, not a close as some campsites I have visited, but this camp did not put everyone right next to each other either. Met a lot of great people! definitely will come back. This is a wonderful place to stay while you enjoy the natural beauty and attractions that Eureka Springs has to offer. The park is very quiet and has absolutely no road noise or bright lighting. The park roads and sites are gravel. Every site has nice trees (very tall, so no interference with satellite disks) and picnic tables. Some sites seem a little close, but our site was quite spacious. There is a nice pool and meeting room and while there are no walkways in the park, the quiet setting is very nice and perfect for walks. The park provides many views of the beautiful mountains. The location is great. It is very convenient to the Passion Play and Jesus statue. We were parked at the end of the park and could literally see the top of the Christ of the Ozark statue from our RV window. The park staff were very nice and helpful. They took us to our site and stayed until we got everything up and running. We have stayed at this facility before and always enjoy it. You can catch the trolley right by the camp ground. The facilities are super-clean and the place is well taken care of. Owners are friendly and helpful with information. Will always return to this place. Pro: Very friendly and helpful staff. Trolley stop right on the premises. Con: Spaces are too close together! Sitting outside with 4 chairs, one had to be right on top of our neighbors sewer hookup. the good parts, camp very nice, people are nice,but: the not so great part, we were put into a site that would almost fit a 25ft 5th wheel, but not close to fitting anything 30ft or greater. the two sites we tried were neither level side to side nor front to back. The sites are VERY close together. there was confusion which sites could handle a sat. hookup. we would come again, pretty, quite, nice but would not come in a motor-home. 5th wheel or travel trailer only and try to get a specific site before you travel a long distance. Great and very friendly staff. Clean and a great place to stay. This was not the first time I stayed at Wanderlust. I find the campground to be very pleasant. The new owners were very helpful getting us in and settled. We were parked on the in the area they call the ridge and in the shadow of a tree. Very relaxing. We were there for 5 nights and next time we are in the area we will stay there again. The owners were very helpful in guiding us to restaurants in the area that are vegetarian friendly. We didn't have any problems. We also travel with 2 small dogs and had plenty of room to walk them.